Here in the USA it is time for all things patriotic! We are decking our porches, our bicycles and of course, setting a red, white and blue tablescape! 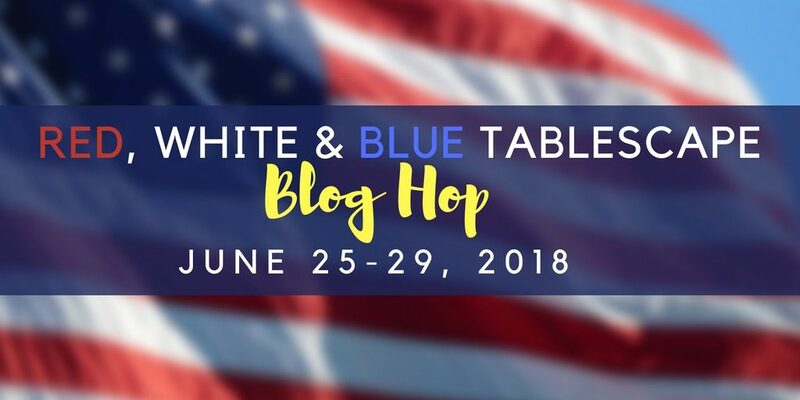 I am so happy to once again be joined by a delightful and talented group of bloggers for this nod to the red, white and blue! These rainy afternoons here in central Florida have us planning more meals inside. Even though we hope to grill out on the 4th, I am setting the table indoors. 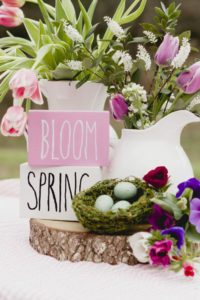 I clustered some smaller elements for my centerpiece, including these great wooden words. I think these mean so much to me. Freedom and liberty are priceless! Here we go…there is nothing more to say, is there? My bicycling Uncle Sam is a new addition this year. I bought him from Michael’s and look forward to using him for many summer holidays in the future! I set my table with a Pottery Barn table throw with a tea-stained look. I set each plate stack on a square jute placemat that I turned on an angle. Red dinner plates were topped with simple blue and white diner-style salad plates. Red-handled Pioneer Woman flatware was the perfect complement. Napkins were both a red and white checkered one and a blue one tied with a piece of patriotic ribbon. Copy of Spring Tablescape Blog Hop I have really enjoyed gathering together these great bloggers this week for our red, white and blue tablescape blog hop! If you haven’t been following along, click on any of the links below to get inspired! 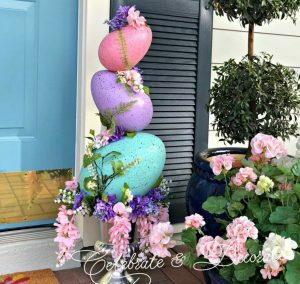 Thank you so much Mary, I really enjoy styling tables and it is so much fun to see what everyone else does for a similar holiday, yet we all come up with different concepts! Thank you so much for hopping with us and a happy 4th to you and your family. Get out there and enjoy your lake! I very much like how you’ve naturalized the look of our red, white and blue on your tablescape, Chloe. I so appreciate this group of bloggers and the fellowship in our love of tablescaping. Thank you! Thank you Rita, I appreciate each and everyone of you who have connected with me through these tablescape hops. It is nice to communicate and share with like minded bloggers! Chloe, I love how you turned your jute placemats on an angle and your tea stained table throw. The bicycling Uncle Same was a perfect addition. I’m learning layering from you and the other tablescapers. I like your pair of napkins coupled together with a patriotic ribbon. You have had an extremely busy week. Thank you for all your efforts organizing and executing these bloghops. It is a lot of work. Enjoy your get away! Thank you Bonnie, I think we all learn from and get inspired by one another! I was happy to have you aboard for another hop! 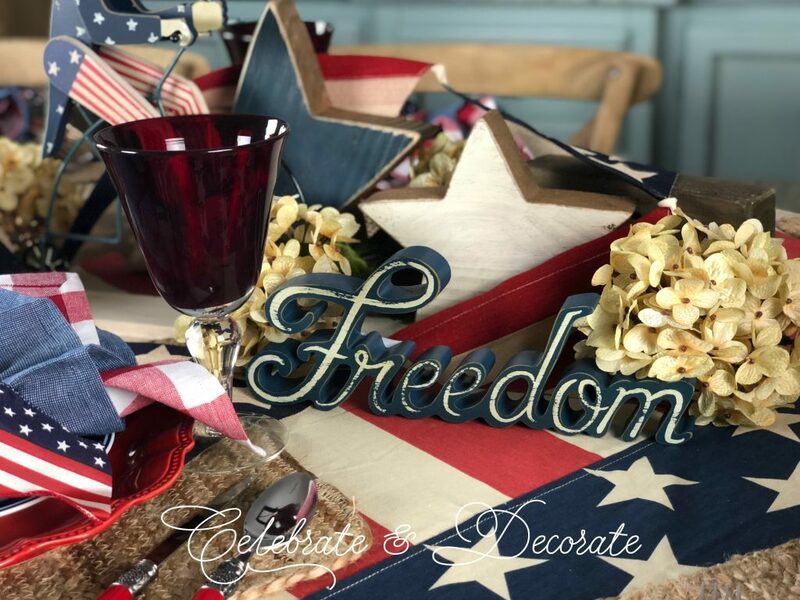 Chloe, well I am quite partial to your tablescape and especially Uncle Sam in your centerpiece — he is also the centerpiece of two patriotic wreaths I made and shared in the link party last May! He’s so special. I see you all took the tea-stained approach with the tablescape around him as I did with ribbons and embellishments in the wreath. Incorporating the signs was just brilliant! Pinned. Thank you so much Debbee! That Uncle Sam was too cute not to bring home and he just might find his way to a wreath on my front door next year! Thank you for pinning, and for joining us in the hop! Happy 4th of July Chloe and what a great blog hop as is the usual with you, my talented friend. Your centerpiece of Uncle Sam and his bicycle is adorable….as is the I’m proud to be an American quote. I have that music (I won’t date myself in identifying the exact form of music it is) haha but my twin boys were in the navy together and that song was sung at their bootcamp graduation….love Lee Greenwood. The bow is so original on your double napkins…you think of so many important details. Hugs and thanks for putting this blog hop together. Thank you for your sweet compliments, Kari! I look forward to seeing your table tomorrow! That is a moving piece of music, especially for those of us with family serving or having served in the military! Happy 4th! Thank you Jenna! Even if we can’t get outside due to afternoon thunderstorms, my oven does a great job on a beef tenderloin! Yes, those collages are a great addition! I may ask everyone to submit an early photo next time so we can have them from the beginning. Thank you for joining me in another hop! Happy 4th! Chloe, your table is the epitome of Americana! 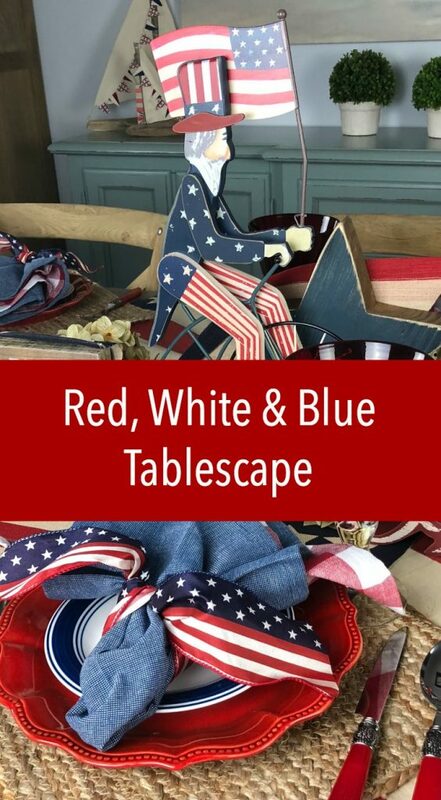 What a fabulous Red, White and Blue display with that bit of rustic charm to it. I love your napkin treatment, all the angles of the placemats and table runner, and the wonderful signs that mean so much, it all comes together perfectly. Thank you so much for putting together this hop and keeping us all updated, I appreciate all the work you put into this. I hope your weather is better for your 4th celebration! Enjoy! Thank you so much Ann! I was happy with how my table turned out without too much work, and a lot of re-cycling incorporated! Thank you for joining us in another hop! Happy 4th! Hi Chloe! 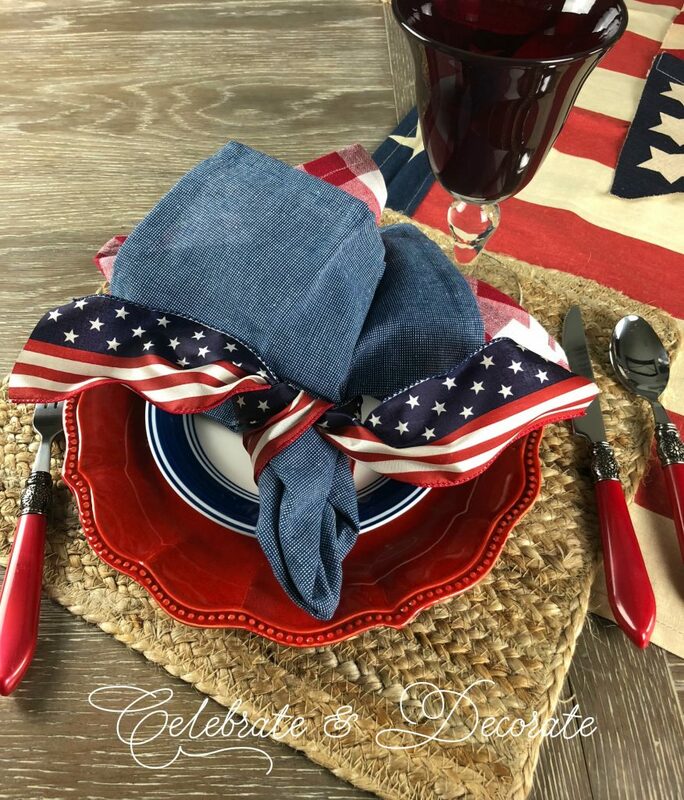 I often worry that a red, white and blue tablescape can look “cheesy” but you have shown me that is NOT true! 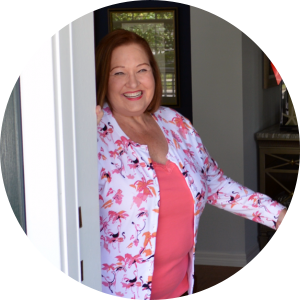 Yours is super patriotic, mixing just the right amount of whimsy with sophistication. Like so many others here, I am crazy for Uncle Sam on a bike! Adorbs!!! Well done, as always! Thank you so much Tim! Sending hugs and greetings for a Happy 4th! 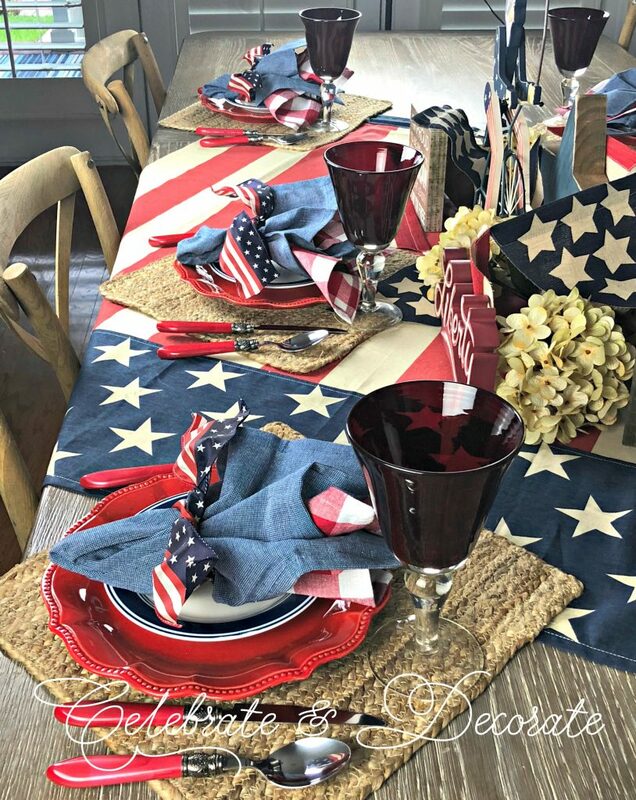 Love your patriotic tablescape! Uncle Sam is so cute on his bicycle. Love that you turned the placemats on a angle, adds some interest! Thanks so much for including me in this beautiful Hop! Thank you Desiree and thank you for joining all of us in this hop!! Chloe, thank you so much for organizing and hosting – as always! I took a minute to feast on each picture, and they didn’t disappoint! Happy 4th and enjoy the long weekend. Thank you so much for your kind complements, Ariel! Thank YOU for being a part of the hop! Thank You for ALL of the RED , WHITE & BLUE! Made my soul HAPPY! Where did you find “LIBERTY” & “FREEDOM”? Happy 4th of July! GOD BLESS THE U.S.A.! Thank you Barb! 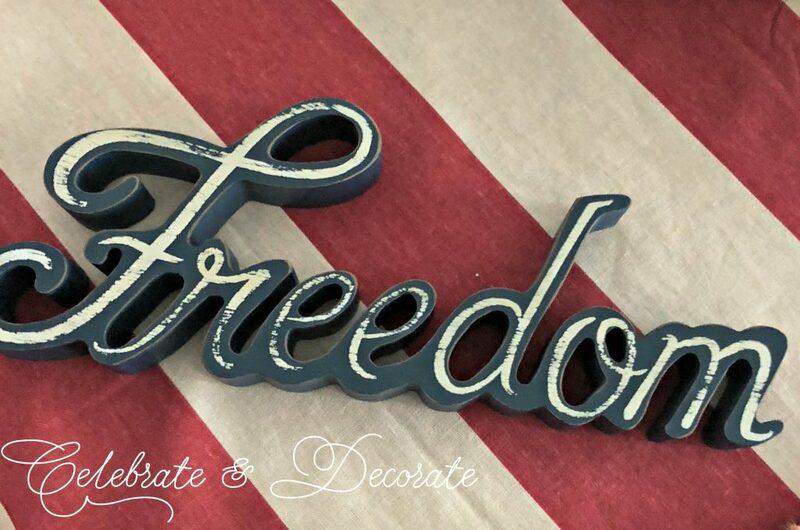 I found the “Liberty” and “Freedom” at Michael’s this year! I couldn’t resist, so thank goodness I had a ice coupon, AND they were on sale! Happy 4th! chloe, Your tablescape is delightful. Using the wooden signs and decor was a great idea. Thank you so very much for including me in t his bloghop. It is always lots of fun to work with you and and these other talented ladies. All your work and organization is appreciated! Thank you so much Wendy! I was happy to have you join in another tablescape blog hop! 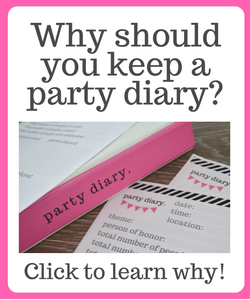 I love partnering with other bloggers on these hops, it is a great way to connect with one another in what is usually an isolating pursuit. Chloe, the tea-stained throw made the perfect table topper for your red, white, and blue Tablescape. 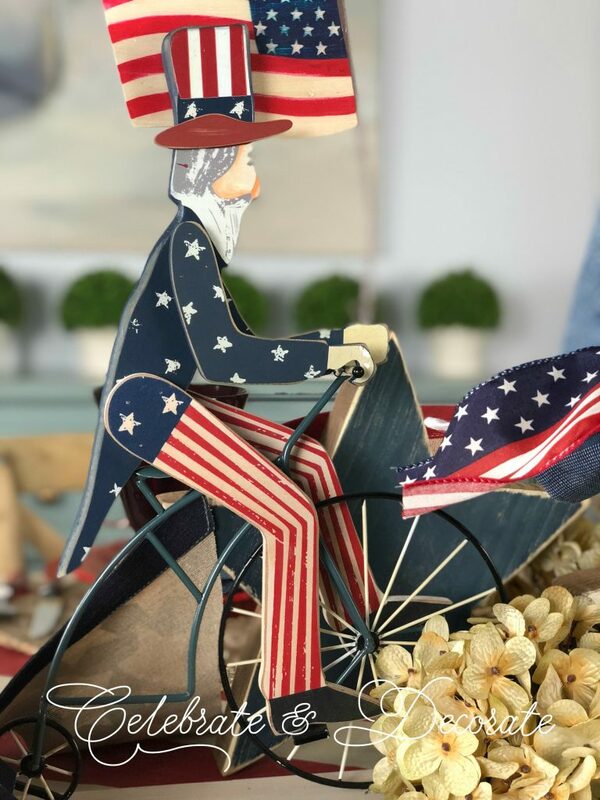 The bike riding Uncle Sam is a fun centerpiece with the wooden signs! Thank you for organizing and coordinating the blog hops, they are always fun! Happy 4th to you and your family! First off, I appreciate you and the effort you put into organzing this blog hop. This is such a lovely group of ladies and they are all so talented! 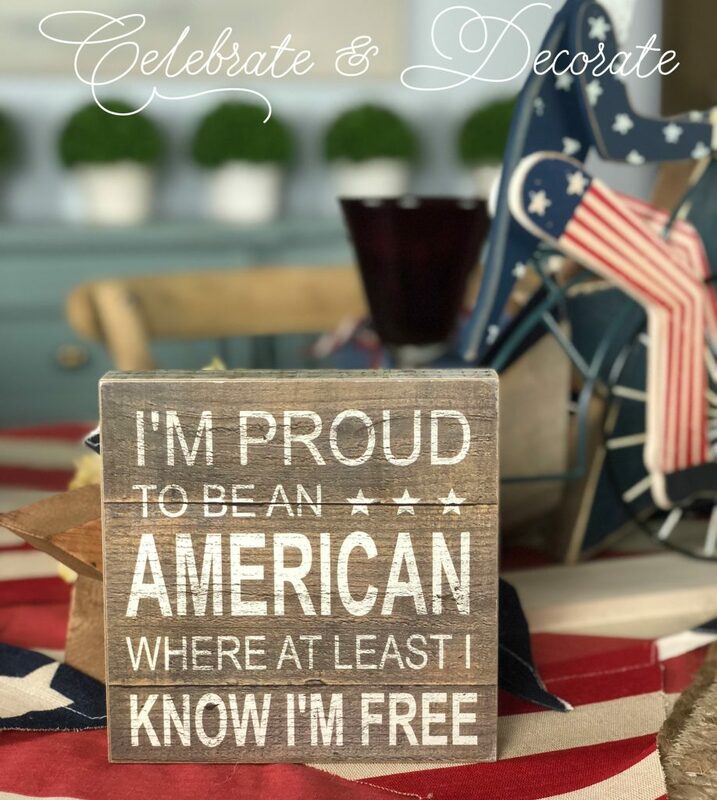 I love the quote “I am proud to be an American,” it really touches my heart and this sign is just perfect for the styling that you have done with this lovley table. I love, love, the natural look with softer and muted tones of reds and blues. Of course Uncle Sam is just delightful and the perfect centerpiece. I really need to get some colord flatware it really adds so much to a tablesetting. Thank you so much Jemma! I really enjoy getting together with all of you, even if it is just online! I am feeling particularly patriotic with my daughter at Army basic training over the holiday! Thank you for always participating in our hops! I can’t wait to see you on TV!!!! Happy 4th to you, too! Uncle Sam is adorable. 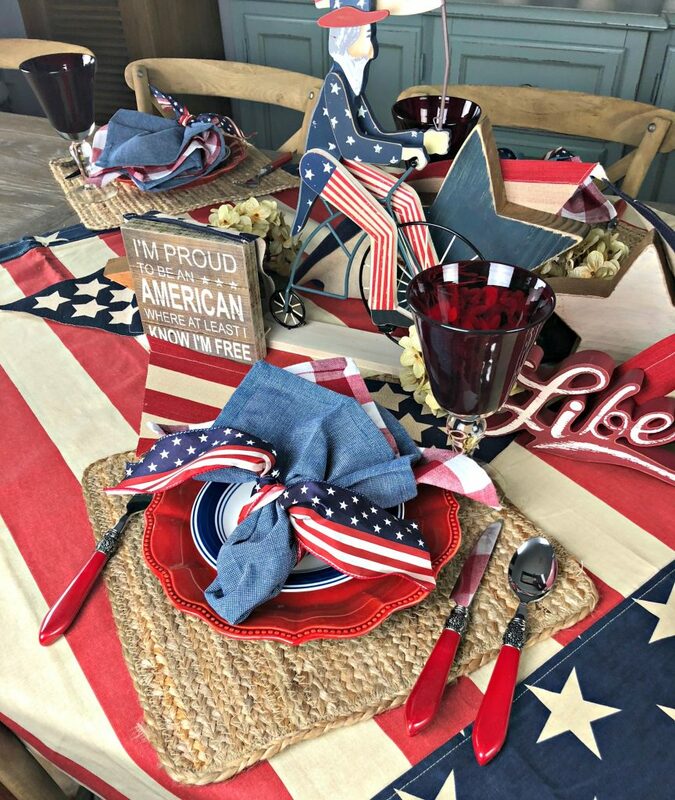 Your table really sets the stage for the 4th. Changing up the placemats is cute. The plates are so pretty. Loving the scalloped edge. Red, white and blue is definitely is the star. Great look tying the napkins. As always a pleasure Chloe to join you on this fun tablescape blog ho. Thanks so much for organizing it. Thank you Marilyn, yes, I agree, God Bless America, the land we all love! Happy 4th to you and your family! Uncle Sam on his bike certainly belongs in the center of this table. The tablecloth was a great investment and I love that you angled the chargers. Thank you so much for your support, friendship and bringing us together again. You are truly appreciated and I wish you a Happy and fun 4th of July. Chloe, your tablescape is gorgeous, as always! Uncle Sam on his bike is so cool and I love, love the tablecloth. 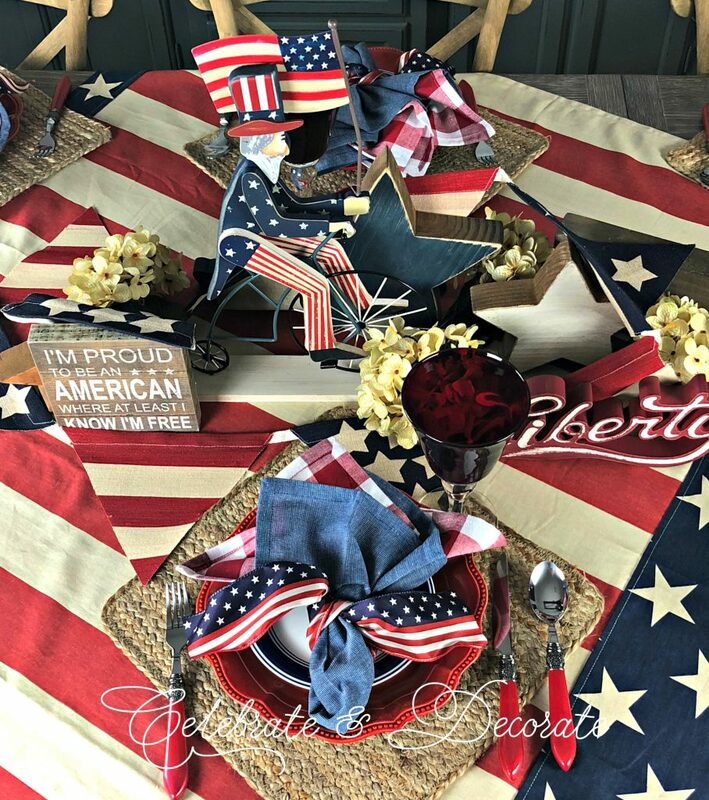 Definitely a patriotic and fun fourth of July table! Hope you have a rain free day and get to enjoy it with your family! Chloe, what a fun tablescape! I love the biking Uncle Sam. So cute! The offset tablecloth and placements really add some dimension. I love your red handled flatware and will need to keep my eye open for that here in Canada. Thank you again for putting together such a delightful group of bloggers who never cease to impress me! Chloe, your table is patriotically perfect! Everything looks just beautiful, I love the pretty Pioneer Woman red scalloped plates. They are the perfect shade of red. The Uncle Sam centerpiece is adorable, and I imagine that he will become a holiday tradition. Thanks again for all you do! I always have so much fun on these hops, and I am always amazed at all the wonderful talent showcased, Happy 4th of July!!! So inspiring, Chloe! Thank you for this beautiful blog hop! Have a great 4th of July! Such a cute Patriotic table Chloe! Isn’t that bike riding Uncle Sam the best (I got him too!). Loving the ribbon napkins ties! Chloe, my favorite element is the Uncle Sam bicycling – wherever did you find him? Surrounded by patriotic words, he is the perfect centerpiece. I love the layered napkins and the rustic feel to this table setting. I think it would be as beautiful outdoors or even in that quintessential barn, with perfect lighting (and no smells) we’d all love to have a Fourth of July picnic in! Perfect. As always. Thanks so much for hosting! Thank you so much Kim! I got him on sale at Michael’s! I couldn’t resist! Oh, how I would love to have access to a barn to style tables, that would be so much fun!